Under the current system, town staff propose a budget to the Hanover select board, which then holds a series of public hearings and finalizes the proposed budget based on feedback. This version is then voted on during an evening “business meeting,” which is separate from the ballot vote. The ballot vote contains other items, such as zoning issues and select board elections. Should SB 2 pass, discussion at the budget meeting and select board hearings would be replaced by a deliberative session a few weeks prior to the ballot vote, and the budget would be voted on along with other balloted issues during the day. Griffin said discussion regarding SB 2 has been minimal, despite some informational and deliberative sessions, and that support for the measure is therefore difficult to gauge. 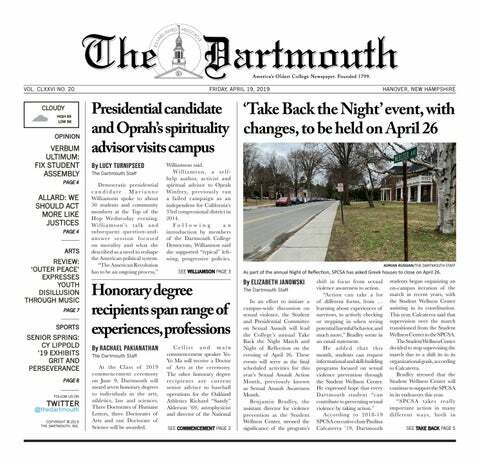 Government professor and Hanover resident Daryl Press, along with Hanover finance committee member John Ruth, petitioned that the article be voted upon on the May 8 ballot. Press said the current low turnout at the business meeting means a low percentage of the population decides on the budget for the entire town. Attendance at the evening business meeting, where residents vote on the proposed budget under current rules, ranges from 150 to 250 people and can reach up to 600, if a hot topic draws a crowd. This is a much lower number than residents who vote on balloted issues such as select board elections and zoning issues, Griffin said. “[SB 2] is about enfranchising the entire community, regardless of what your policy views are,” Press said. Press called the Hanover community “educated” and “engaged,” saying he was disappointed that voting procedures do not seem to match this engagement. “Our voting procedures are designed in such a fashion that we disenfranchise our highly politically active community,” Press said. He added that the current system tends to make it harder for families with children, those with early morning jobs and elderly residents without reliable transportation to vote. “If we’re looking at 10 percent of the voting population, are we really getting an accurate representation of the town?” Hanover town resident Kevin Cotter said. Press said heavy participation in meetings and deliberation regarding the school board budget suggested Hanover voters would be similarly involved in deliberative sessions under SB 2. According to Griffin, however, across New Hampshire SB 2 towns, an even smaller number of people attend deliberative sessions than the number of those who attend business meetings under traditional town meeting laws. Additionally, she said that SB 2 rules allow deliberative sessions to be “hijacked” by a small group of individuals. Under the current system, attendees at public meetings can provide input to the select board and discuss the issues, but cannot vote to modify the budget upward or downward. Griffin said that under SB 2, low attendance at deliberative sessions, in combination with voters’ ability to amend the budget, would allow groups with strong agendas to push the budget in a certain direction. “[Deliberative sessions allow] taxpayer groups, or others with an agenda, to come out and decimate the local budget that’s being proposed by the select board,” Griffin said. Across New Hampshire’s SB 2 towns, small groups of people have zeroed out or radically lowered local budgets through amendments at these deliberative sessions. she said. It is these amended budgets that are then voted on during the official ballot vote. These amended budgets are significantly lower than the originally proposed budgets, “making it very difficult for a community to continue to operate,” and eventually causing residents to be dissatisfied with a lack of services due to the decreased budget, Griffin said. Newport town manager Hunter Rieseberg explained that SB 2 towns such as Newport have not seen the bill positively impact voting participation. “I don’t think SB 2 was ill-intended — it just didn’t work,” Rieseberg said, adding that Newport has attempted to return to traditional town meetings on more than one occasion, but the required three-fifths super-majority has proved a hurdle. Rieseberg agreed the passage of SB 2 will probably increase the number of townspeople voting on the budget, when directly comparing the number of those voting at the polls to the number voting on the floor of town meetings, but he expressed concerns regarding overall public engagement and voters’ knowledge of the issues. “If your goal is to increase public dialogue in involvement as defined by information and sharing of perspectives and debate … SB 2 will not achieve that,” Rieseberg said. Town meetings allow space for voters to understand what their neighbors think, and to hear debates surrounding the issue, including debating specific articles and details of provisions, according to Rieseberg. Due to the difficulty of attending both a voting session and a deliberative session weeks earlier, many voters choose to only cast a ballot without the benefit of the conversations during town meetings, he added.